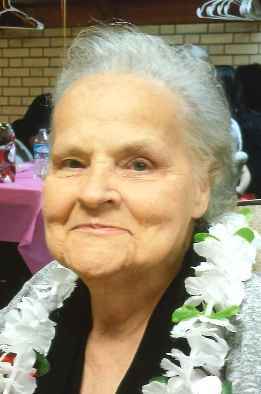 Betty Ann Topel, 75, of Fremont, OH passed away Saturday, October 14, 2017 at ProMedica Toledo Hospital. She was born on April 8, 1942 in Fremont to William and Virginia (Schneider) Edwards. Betty married Frankie Lamar Topel on June 22, 1959 in Findlay, OH and he preceded her in death on June 13, 2015. She worked at the Fremont Eagles as a waitress and then at Yerges Manufacturing until they closed. Betty was a member of the Eagles and enjoyed playing cards, bingo, traveling, listening to George Strait, watching television, and spending time with her family, especially at family cook-outs. Betty is survived by her children, Tina (Stephen) Krochmalick, West Palm Beach, FL, Terri (John Barnes) Topel, Tracy Peterson, Barry Topel and Trisha (Don) Zucker, all of Fremont, OH; sisters, Vicki (Clarence “Buz”) Balduf, Oak Harbor, OH, Linda (Fred) Fitzgerald, Clyde, OH; twelve grandchildren, nine great grandchildren and many nieces and nephews. She was preceded in death by her parents; husband, Frankie Lamar Topel; son-in-law, Charles Peterson; sisters, Yollie Ameling, Mary Sabo, Barbara Rigsby, Judy Sutter, Rose Koester; brothers, William, James, David and Richard Edwards and an infant brother. Visitation: Wednesday from 3 to 8 p.m. at Wonderly Horvath Hanes Funeral Home and Crematory, 425 E State St., Fremont, OH with an Eagles service at 7:30 p.m.
Service: Thursday, October 19, 2017; 11:00 a.m. at the funeral home with Pastor Forrest Kirchenbauer officiating. I enjoyed visiting with her at the nursing home. She laughed and told everyone about babysitting us when we were little. Her goal was to get to Florida on her trip. Glad she was able to. So sorry for your loss. She will be missed. Many memories! My Deepest Sympathy to the entire family. May God be with you in the days ahead. My thoughts & prayers are with you all. I am so sorry for your loss. Your Mom was a beautiful person.